"All of the plays, the movies, this Madea character has been an incredible tool for me to reach the people who are unsaved....It allows them to come in, have a good time, relax and open up with laughter and then have the seeds planted." While on the rub from the "PoPo", Madea takes refuge at Aunt Bam'a house. While there, Madea lays down the law and drops the hammer on Bam's family and their friends. 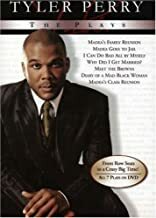 What's your favorite Tyler Perry movie? Click below to find Tyler's movies on DVD, and blu-ray.